Sept. 19, 1:14pm— An earthquake of magnitude 7.4 strikes Mexico, with the epicenter 55km south of the city of Puebla and 120km from the capital, Mexico City, where I’m spending my semester abroad. It is the second quake to strike the country in less than two weeks; the first one, which occurred on Sept. 7, was the strongest in a century with 8.1 magnitude. It resulted in at least 98 deaths in the southern states of Chiapas and Oaxaca, and caused panic and partial loss of electricity as far away as Mexico City, about a thousand kilometers from the epicenter. Today, however, the nature of the shock waves—sussultatory rather than undulatory—is much more destructive, and the epicenter is much closer to Mexico City, which was built on a former lake bed, amplifying seismic movements. 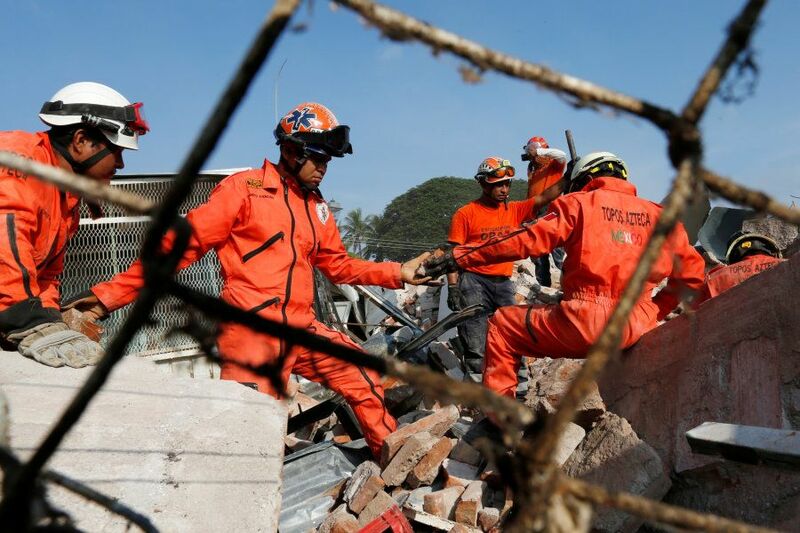 Just two hours before, the country had run a seismic drill to commemorate the devastating 8.0 earthquake that occurred in 1985, causing over 10,000 deaths: at the sound of the alarm, buildings were evacuated and sirens were turned on in ambulances. When the real earthquake hit, however, the seismic alert system did not go off in various parts of Mexico City, leaving people with no time to prepare. I’m on the university shuttle on the way home after class, and due to the motion of the vehicle I barely feel the tremor: I only realize what is going on because I see a concrete bus stop oscillating. Still, I think the intensity must have been minor, compared to the Sept. 7 earthquake that had my flatmates and I holding each other while our sixth floor apartment swung violently. This time, it is only when I get home and see the cracks on the walls of my apartment and the pale faces of my neighbors that I grasp the gravity of the situation. Sept. 20, 9am— I wake up at a friend’s house, who, knowing that I live on a high floor, had offered to let me stay at his place. The invitation was generously extended: there are nine of us camping in various corners of the house. Some, like me, are there to escape heights; some got trapped in this part of the city due to the breakdown of transportation; some just didn’t want to sleep alone. After the earthquake, we all huddled up together, at times laughing—a bit hysterically—at the absurdity of the situation, at times watching videos of collapsed buildings and explosions caused by gas leaks in horror. Sept. 21, 11:30am— With car hoods packed with food, medicine, sanitary products, and one giant sack of dog biscuits, my friends and I squeeze into three cars to join a solidarity caravan bringing donations to the rural town of Santa Cruz. 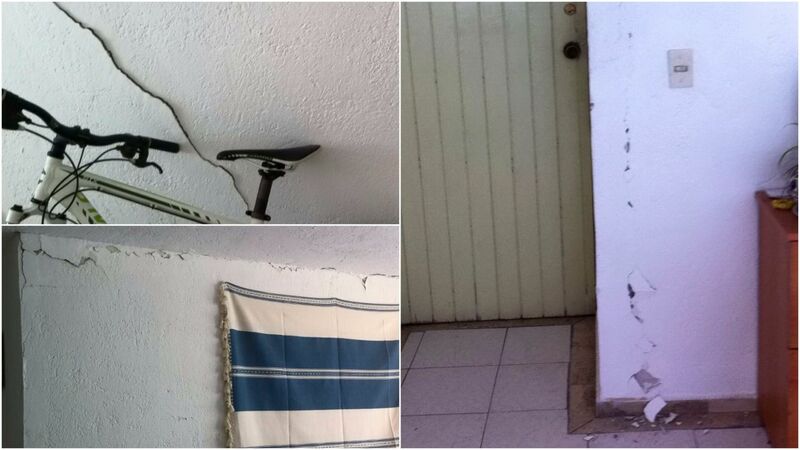 We’re in Cuernavaca, in Morelos, one of the states most affected by the earthquake together with Puebla. 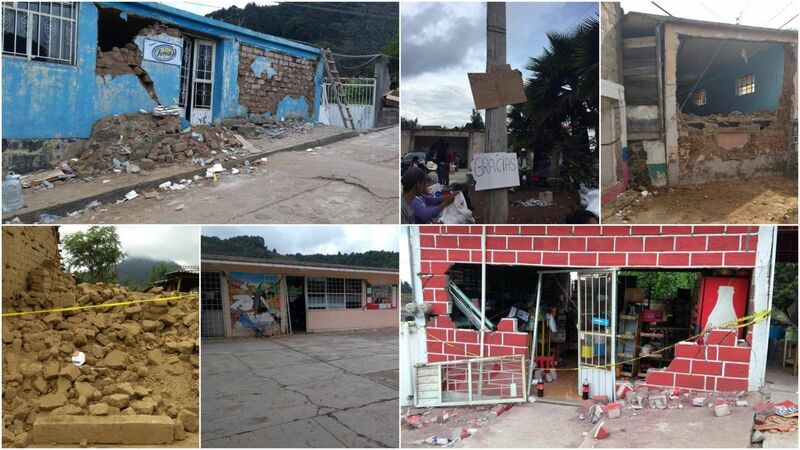 Aid is getting to the isolated towns in the mountains and countryside more slowly than to Mexico City despite the fact that some of these towns are almost completely destroyed. So, yesterday we left the capital and headed south-east, closer to the epicenter. Although Santa Cruz is only about 60km away from Cuernavaca, the drive takes three hours, partly because the narrow mountain roads are clogged with cars and vans transporting donations around the area. When we finally arrive, we spend the afternoon distributing water, sanitary products and food packs door-to-door, climbing over the rubbles of collapsed homes. My group ventures to the surrounding areas to reach some houses outside the town: the road is blocked by a fallen tree, so we fear aid operations on motor vehicles might not have stretched beyond that point. Indeed, once we get there, we find an old woman too sick to walk to town for provisions, along with many families who were not even aware that supplies were being distributed in the City Hall square. On the way back, we run into a group of local residents with buckets of tortillas, rice and frijoles con mole to distribute to neighbours and volunteers alike. They have been hit by the earthquake, too, and yet they prepared food for others. We sit on the side of the road to eat. The view is gorgeous. We leave Santa Cruz around 7pm. The drive back to Cuernavaca is interspersed by the sound of horns from the cars passing in the opposite direction: they see the signs identifying us as solidarity caravan and cheers us in support. Many of them are similarly marked and we greet them with equal enthusiasm. On the side of the roads, some people are standing with signs carrying messages such as “Thank You” and “God Bless You”. For the entire drive, we keep seeing Centros de Acopio, collection centers for donations, which constellate the region as if they had sprouted from the cracks left by the earthquake. Pictures of Santa Cruz taken by my friends Sofia and Diego. 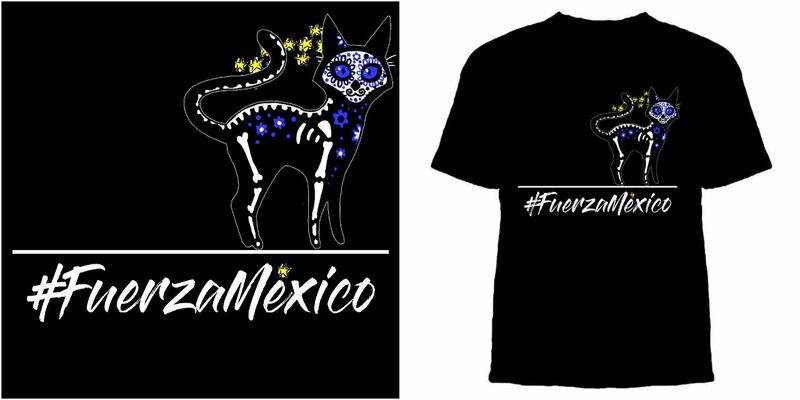 Sept. 22, 2.21am: Sofía, an art student in the city of Guadalajara, announces on Twitter that in less than 24 hours she had raised 17 000 Mexican pesos (1300 SGD) for earthquake relief by selling stickers she had designed featuring Frida, a rescue dog that has been involved in the search for survivors in Mexico City. 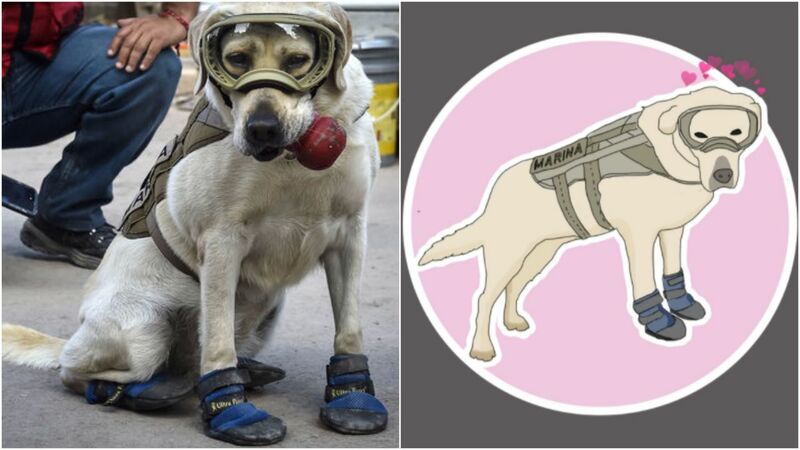 After pictures of her wearing goggles and little dog-boots were posted on Twitter by the Mexican Navy, Frida has turned into a national celebrity, having helped save 12 lives after the recent earthquake and 52 throughout her career. The entire country is swooning, and within a couple of days, Sofía’s stickers were being sold in various cities across the country, as well as in Canada and the United States. The mobilization is not limited to universities within Mexico: Mexican students at Brown University raised 1535 USD (2065 SGD) for the Red Cross in one day by selling Mexican pastries and prints of their artwork. Sept. 23, 10am— Back in Mexico City, I head to the Olympic Stadium of the National Autonomous University of Mexico (UNAM), the most important public university of the country, where I’m currently spending my semester abroad. 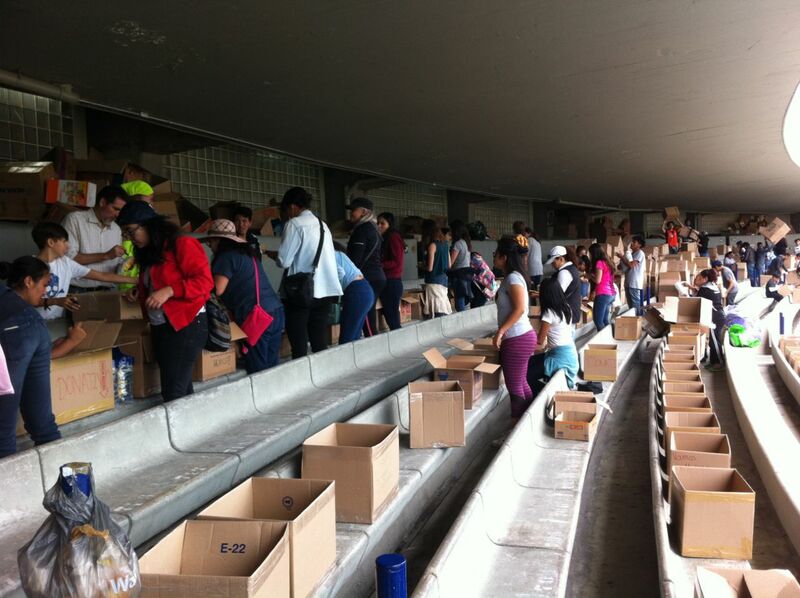 Faithful to its mission of being “at the service of the country and humanity”, UNAM started mobilizing its students immediately after the earthquake, transforming its stadium into a collection centre and meeting point for brigades. On the first afternoon after the earthquake, buses brought 1500 people from the stadium to the rest of the city to join rescue operations; at around midnight, UNAM’s Facebook page had to ask students to stop coming because too many volunteers had showed up. In the following days, the University sent more than 4000 architects and engineers to assess the state of buildings around the city, 20 teams of psychologists delivering counselling services to survivors, and opened the doors of its veterinary hospitals to treat injured pets. In the time we spend in the stadium forming human chains to load trucks of donations, countless people walk around offering water, coffee, biscuits and sandwiches to volunteers. Most of them have no uniform, badges, or any other marks identifying them as members of some official organization; most likely, they are just neighborhood residents who spontaneously decided to show up with food. The man who serves me a cup of coffee this morning is the same who did so yesterday evening. He has probably been there for the entire night. Volunteers working in the University Olympic Stadium. Sept. 24, 8pm— As of today, the toll stands at 320 deaths, 38 collapsed buildings in Mexico City alone, and more than 2000 injured—figures that will only keep rising. Every night, we go to sleep with a backpack of essentials next to the bed ready for evacuation: just yesterday morning, I rushed out of bed and out of the building at the sound of the seismic alarm, announcing a 6.2 aftershock of the September 7 earthquake, with the epicenter in the south. At every new quake, people in the street cry otra vez, “again”. Yet it is not all devastation. The past week has also seen one of the largest mobilizations I’ve ever witnessed, and a demonstration of the culture of solidarity deep at the core of Mexican society despite, or maybe precisely, because of the huge social issues the country battles with. On Oct. 13, a Mexican Fiesta will be held at Yale-NUS College with the aim of raising funds for Mexico and Puerto Rico, which is also suffering from severe damages in the aftermath of Hurricane Maria. Your favorite Latin beats will accompany a sale of Mexican food, as well as T-shirts with a design inspired by the traditional Sugar Skulls of the festivity Día de Muertos (you can pre-order them at: www.tinyurl.com/InAsiaMXPR). We hope you will come down and be part of the solidarity movement that is rebuilding Mexico. A preview of the T-shirt.